This JacQue Textile Designs ltd listing is for BRAND NEW high quality soft and stretchy fabric made from 95% polyester 5% spandex. This fabric has very nice rich feel and has soft hand with very nice stretch. These fabrics are designed only by me and are hand created. 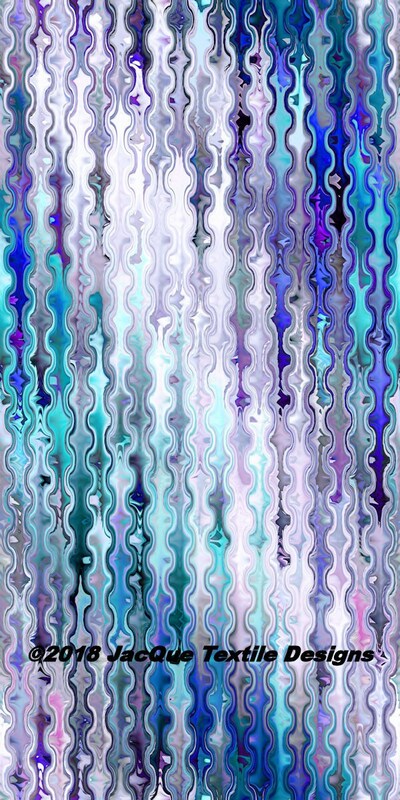 These unique fabric designs would look wonderful in a clothing, shirts, dresses, maxi skirts, headbands, scarves, baby clothes and lightweight blankets, home decor, accessories, other art items. IF YOU SEE ANOTHER DESIGN YOU WANT I CAN USUALLY MAKE IT ON ANY VARIETY OF FABRICS I CARRY. This is for one piece of high quality fabric. The fabric has a cotton look and feel but has less shrinkage. It has no sheen to it. It measures as 56" inches wide by 36" inches long. This fabric is washable. The weight of the fabric is nice medium weight fabric. There are several processes used to make these unique fabrics. Each piece of fabric is a piece of art work. All of my fabrics are in perfect condition. Each piece of fabric is each individually made. These unique designs have a hand dyed appearance due to the process which they are created. They are printed using the highest quality textile inks. They are printed with inks and the hand of the fabric is not changed. All of my fabrics have a soft and smooth surface. (C) Copyright 2016 by Jacque Textile Designs Ltd All Rights Reserved. No Part of any of these designs may be reproduced. I always combine shipping Cost! Please email me for combined shipping cost, then I can send you invoice with the correct shipping cost. If you are unhappy with your order please let me know. If you have any questions about my fabrics, please email me, and thank you for looking! If you see a design you like but you want it on a different fabric please contact me and I will be able to personalize a listing for you. All of my fabrics are washable. There are some that are not washable but it is listed in the item description if they are spot only cleaning. Wash separately in cool or warm water using a gentle machine cycle and phosphate-free detergent. Machine dry using a low temperature setting, or line dry fabric.